The importance of data is evident, but it’s essentially worthless unless it is properly stored, intelligently connected, and made accessible. 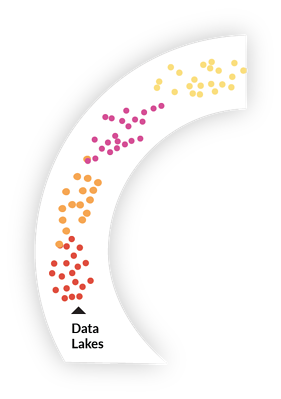 To illustrate the path to reveal the full potential of your data we have defined the 4 main stages of data usage and how the data becomes the asset of the company with more technology taken place. Without integrations between the various systems that are generating data, hotels only have access to the most basic form of data usage. The hotels in this phase of zero data are reading occupancy reports on paper or Excel, seeing the number of covers in a restaurant in daily reports, and understanding data as single data points. There is no data aggregation occurring in these data reports and no connectivity between any softwares. Hotels in this phase are mostly using data to understand general statements of the business, without any insights or explanation as to why they are witnessing certain KPIs numbers and performance trends. By simply seeing that occupancy is lower than expected, a hotel cannot respond to this information as no additional insight is given from this raw observation. In order to understand the dependency of data sets better, some basic integration at a minimum is required before reaching the next phase. In the industry today, many PMS providers offer rich functionalities to its users for more advanced opportunities of further analysis. Additionally, trying to solve the issue of data silos in the industry has created discrete data sets and low integration levels. Companies need to enhance their systems with additional modules and tools like the ones provided on the SnapShot Marketplace. Hotels in this phase are usually conducting basic reporting through using their PMS system with other tools. For example, by combining data from PMS systems with connections from financial systems, hotels could add their budgets to overall performance KPIs, as well as pull the detailed cash flow statements. In order to take it one step further, these hotels should begin integrating PMS data with distribution solutions to avoid overbooking and keep updated inventory and rates in real time. While these hotels are saving time in maintaining operations, they still aren’t capable of producing instant report aggregation across multiple data sources in this phase. In most cases, hotels find solutions in building overall business performance reports through Excel reports based on several pivot tables, manual segment remapping and hours of work from manually pulling data from different systems and databases. Even seeing your total revenue from both room revenue and F&B outlets requires several hours of modifying several reports in Excel in this phase. 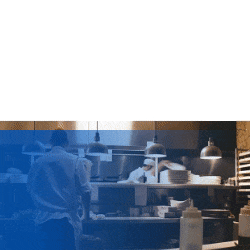 Hoteliers need to look at occupancy numbers, F&B turnover and covers, housekeeping inventory, and more in order to make informed business decisions. This means there are even more data points to be analyzed and compared, which is a step up from phase one. Acknowledging the need to store all data in one single repository could solve most of hotels’ problems and challenges faced during this phase, which is still be considered reactive decision making. 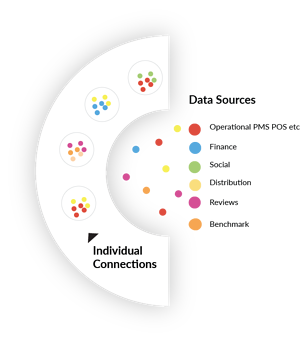 Once individual connections are made, the natural next step would be to start making connections between more data points, which is where data lakes come in. Data lakes are essentially a centralized copy of the data where all the raw data is copied in a central cloud-based location where they can be accessed. While an improvement from virtual databases, it still requires converting the data before it can be used. Data lakes move both structured and unstructured data from various systems into one - a single place where data is stored until needed and is then later prepared for use. Hotels in phase two who are aware of data lakes and have data scientists are then able to create customized analytics through the unstructured data. For example, Amazon Web Services (AWS) utilizes data lakes, which allows hotel enterprises to store both structured and unstructured data from multiple sources, including mobile applications, CRM platforms, and more. With data lakes, hotels have the ability to store the data retrieved from multiple systems in one central location and use queries to start combining the data sources to discover more correlations and dependencies. This is the first step in moving from a reactive approach towards a proactive one as you are then able to analyze the dependency of your occupancy from your rates from distribution channels, benchmarking, and pricing. This new step in phase two allows your hotel to identify the reason for your current business performance and implement a new strategy for improvement. However, having all your data in one place doesn’t immediately solve the issue of harmonizing data. Bringing together structured and unstructured data for actionable insights presents many challenges without the proper tools. For example, it’s beneficial to have all reviews stored in a data lake, but without the right solutions, you cannot build correlations of text data with your performance KPIs. 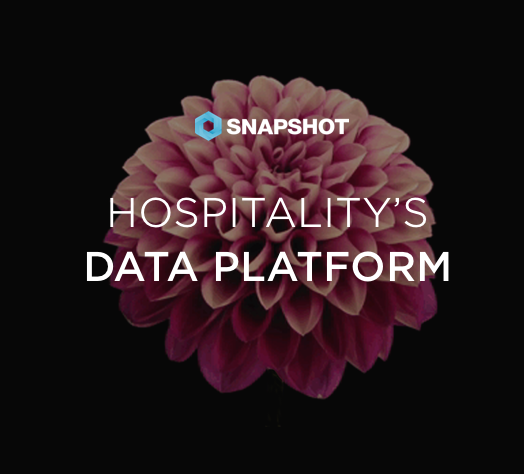 There are existing hospitality data solutions that are able to correlate multiple data points and sources into actionable insights. For instance, SnapShot’s AnalyticsPro allows hoteliers to unify their segments to get instant pick up reports from various data sources and systems. These reports are then instantly available to be downloaded, saved, and shared with other parties. The data tool also includes a data dashboard that oversees all KPI performances, including tracking revenue, website traffic, rate variations, POS analytics, and more - from your PMS, POS, social media profiles, competitor sets, and other data sources. After data lakes comes an even more advanced form of data analytics and integrations - data hubs. A data hub is a standardized method of collecting the data wherein the data is harmonized when it enters the hub to be reused with standard definitions across multiple properties, data sources and more. 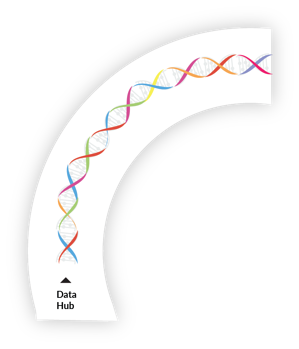 Data hubs go one step further by moving data and then indexing it into the new system. A major benefit is that when a hotelier wants to pull any customized data, due to the open APIs and data harmonization, this can be done efficiently through standard requests. If a hotel company wants to add review data to their data platform, this is integrated in an industry specific manner and relevant to the rest of the data. Other hospitality enterprises can then benefit and request that their data is also added. Thus, a network effect is created where the entire industry using different systems can integrate multiple sources of data and standardize their output. This converted data can then be altered to the necessary formats and sequences thanks to the data hub. While data lakes copy original data, data hubs allow the data to be restructured into customized formats and easily accessible from multiple data sources into one unified format, which then opens up opportunities for multi-dimensional analytics. For example, a hotel could combine the data from its PMS with its POS to pinpoint which market segments have the most influence on the revenue from a specific F&B outlet. This would show the hotel who its main customers are and allow them to adjust its offerings for them. Additionally, hotels can gain even more insight by integrating a customer relationship management (CRM) system to provide special offers to valued repeat guests to improve their experiences based on existing data of their known preferences from previous visits. The SnapShot AnalyticsPro dashboard uses its data hub and many integrations with POS, PMS and CRM systems to provide such readily available analytics to its users to benefit from the information. Data hubs open further opportunities for data mining and predictive analytics with the end goal of being proactive and anticipating the needs of current and future customers. Machine learning and implementation of algorithms are just the beginning steps towards this goal, which is much more than just focusing on historical data. Some hotel groups are already using machine learning to provide the best guest experiences. The Dorchester Collection, for instance, has implemented machine learning of guest reviews to discover the importance of their hotel breakfast offerings to then offer a more customized breakfast option for guests and to adjust its marketing approach to focus on breakfast, according to the Harvard Business Review. With data hubs and API access, hotels can work on developing new algorithms to mine other important external data sources. For example, as mentioned by Hotel Management, the US economy-hotel chain Red Roof Inn created a campaign called, “Flight Cancellation Coup,” to track public weather and flight data to adjust their targeting marketing campaign to travelers stranded by flight cancellations. With hotels located near busy airports, Red Roof used data algorithms to target travelers with cancelled flights and turn them into new customers. 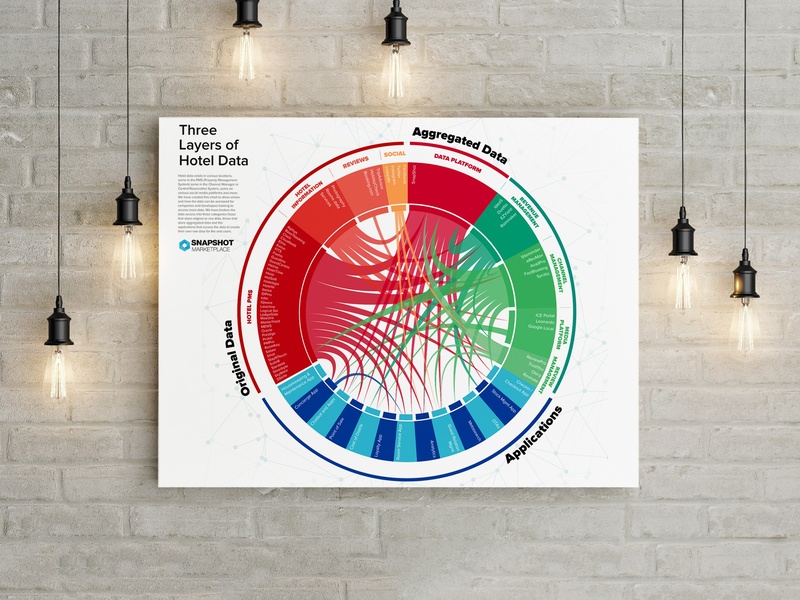 Data visualization, patterns, trends, and correlations are already possible with data hub technology, but it’s the next phase where the hospitality industry still has some catching up to do. Machine learning and artificial intelligence (AI) are already prevalent in major technology companies like Google and Facebook, and the hospitality industry can also learn from these technology leaders to implement it into hotel practices. Artificial intelligence (AI) has become a common phrase in many industries when concerning the future of technology. In regard to data, AI allows for intelligent structuring and better management by the people trying to analyze the data. Rather than manually pulling reports and filtering them according to specific requests, AI takes the advances made by data lakes and data hubs and makes the more efficient for the users requesting the data. With machine learning and natural language processing, AI will eventually eliminate the needs for hoteliers to make individual requests in data hubs to have the technology produce the reports automatically to improve hotel operations. With the existing technology from data hubs, eventually the data from different data sources, unified segments, and reporting across multiple properties with varying PMS systems will be the next step when it comes to AI. If the data is already properly collected, stored, and analyzed through platforms like SnapShot’s AnalyticsPro, predictive analytics is naturally the next phase data hubs will evolve into since the foundation is already present. However, as seen with the example of Red Roof’s predictive algorithms for targeted marketing and a few other cases, the hospitality industry is catching on to the AI solutions trend. According to McKinsey, one hotel group is using algorithms to predict next-product-to-buy patterns from customers to increase revenues from ancillary purchases, not unlike the airline industry. If the hospitality industry were to implement AI technologies used by companies like Google and Facebook into its data analytics technology, hotels would be able to eliminate the amount of human effort put into building data reports and manually comparing performance of various hotel operations. With machine learning, hoteliers could instead focus on making strategic decisions and conclusions from the predictive analytics provided by AI. 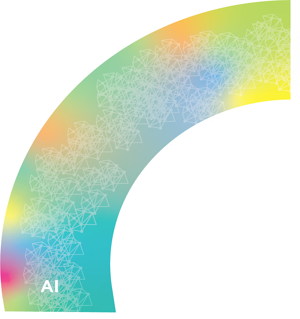 As AI itself develops, more specific branches of artificial intelligence will become more and more relevant to individual industries. For example, reinforcement learning, one of machine learning’s legs, allows customers to use historical data from customer activity to better understand the customer and predict how they will respond to certain marketing campaigns. If this technology were applied to the hotel industry, imagine how much could be saved in marketing campaigns when trying to reach repeat customers. Eventually data will be taken from the researching part of booking a hotel room, rather than just the final purchases made. When other industries are narrowing down on how to analyze the entire booking journey from initial searches to entering credit card information, the hotel industry will soon learn how much more data there is to be collected and analyzed to keep up with and soon beat its competition, whether it’s competitor hotel groups or OTAs or even Google.